Primary Source is hosting a global read of Bamboo People this week involving 90+ educators and students. I'm tuning in every now and then before my official live appearance on Wednesday from 3-4 p.m. EST (register here if you're interested in joining us). I've been absolutely fascinated by the deep insights and responses to my novel. Here's an example of one of the questions posed in the forum followed by answers from six different educators. What significance did Chiko's glasses play throughout the book? Perhaps losing his eyeglasses also indicates that Chiko must learn to "see" people and the world in a new way. Before the events of the book, he had lived a sheltered, protected life and seen the world through the lenses or eyes given to him by his parents. In the story, he experienced the reality of life for himself, both good and bad, to become his own person. He would always rely on the view of the world first instilled in him by his family, but he had to discover that one sees and learns about living through more than just the eyes. Chiko was lucky enough to have been taught to read, unlike most people in his country. The glasses are a symbol of his ablility to read, to be open and learn, to be worldly, and survive in the rebel army. They allowed him to stay alive. He was useful to those "above him" and was protected, even from the abusive captain, by his ability to read. To some extent, his reading also helped his young friend in the army as well. I also believe that the glasses helped Chiko and Tu Reh to have a new lens into each others' cultures. Chiko was always more open and giving, but Tu Reh was filled with rage and hositility towards the enemy, and Chiko at first, was the enemy. Tu Reh's rage abated somewhat when he continued to see a wounded Chiko reach for his pocket for his lost glasses. The lost glasses made Chiko vulnerable to the enemy and made the anger of Tu Reh vulnerable as well. One lens was cracked, the other, still intact as I recall. Could a cracked lens mean the loss of a sheltered homelife, the loss of the innocence of Chiko and the demands of the cruel world he was being exposed to? Is the intact lens the hope and love that Chiko carries in his heart throughout the story from a home filled with love and education, even when death had threatened him by a bullet and by the "enemies" in the camp who had Chiko's life in their hands? The comments above have given me more to think about in regard to the glasses—how Chiko sees the world, the broken lens like his broken body. I was thinking of the glasses as a symbol of intelligence and common sense—qualities possessed by civilized human beings. 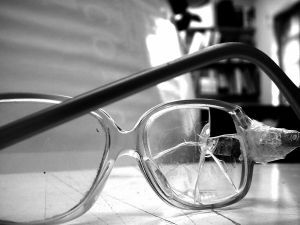 When the glasses were knocked off Chiko's face it was through brutal, uncivilized behavior. The glasses seemed to rest on the balance between the two worlds. Just as they kept slipping down Chico's nose and getting lost, so was his world. The world of books and knowledge as he knew it was sliding away and the world of chaos was closing in. The fact that only one lens was broken and that they were returned each time they were lost provided a sense of hope. As the glasses would never be the same, so his life would not. But there was always hope. Chiko was the only individual ever described as needing glasses throughout his time at the training camp and later at the refugee camp. This distinction is important because it highlights that he is the only individual, in either camp, that has the benefit of an education that allows him to view this conflict in its entirety, taking into account what his father has taught him about his Karenni friend and about the world in general. Because his education is so comprehensive and modern in the sense that he is encouraged to have a very open view of the world, Chiko has a different outlook, represented by his unique set of glasses. However, Chiko's glasses do not remain perfect and, as a result, his outlook changes. It is at the training camp that one of his lenses becomes cracked. This represents that the army has influenced his outlook of his recent life absorbed in his books. Despite this minor setback, Chiko remains resilient, never abandoning his academic roots. It's humbling--and a bit eerie--to realize that much of the symbolism seen in my novel by these observant teachers was not consciously intentional on my part. More evidence that stories are penned by heart as well as mind, and then enriched and illuminated by the reader's eyes.